A study of select Muslim schools by Inga Niehaus (Islamic schools between academic achievement, religious identity formation and democratic citizenship: Voices from learners and teachers. Paper presented at Muslim minority rights, Islamic education and democratic citizenship symposium. University of Cape Town, Cape Town, 2008, October 8–9) determined that Muslim independent schools were initially established in South Africa to provide an environment which would protect Muslim learners from the predicaments that beset public schools, including a drop in standards and ill-discipline, as well as to accord them the space to practise their faith without obstruction and develop their Islamic identity. An added advantage would be that learners would not have to attend the madrasah after school hours since the madrasah curriculum would be integrated with the normal school curriculum. This chapter will commence with an exploration of the tensions between Western and Islamic epistemologies, as identified by the pioneers of Islamization, and as a prelude to the emergence of the concept of Islamization of knowledge. Next, it will assess the implementation of Islamization in Muslim independent schools in South Africa. Finally, it will assess the prospects of the Islamization project. 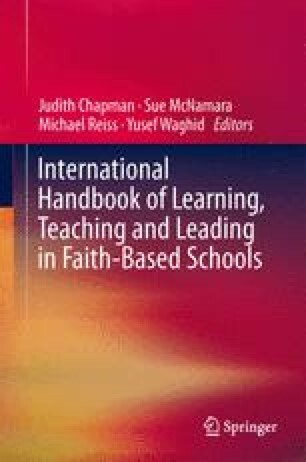 This chapter hopes to demonstrate that the notion of Islamization of knowledge accords with Ralph Tyler’s theory that an educational and social philosophy can actually act as a screen for selecting and eliminating educational objectives (Basic principles of curriculum and instruction, University of Chicago Press, Chicago, 1975: 34). About IBERR [International Board of Educational Research & Resources]. (2004). http://www.iberr.co.za/index2.php?option=com_content&do_pdf. Accessed 17 Apr 2012. Elmessiri, A. M. (n.d.). The west and Islam: Clash points and dialogue. http://www.muslimphilosophy.com/ip/21-cen.htm. Accessed 21 Apr 2012. Esposito, J. L. (n.d.). Rethinking Islam and secularism. The association of religion data archives. http://www.thearda.com/rrh/papers/guidingpapers/Esposito.pdf. Accessed 10 Apr 2012. Tayob, A. I. (n.d.). Islamic education in South Africa: Meeting the demands of change and uncertainty. In J. Chesworth & F. Kogelmann (Eds. ), Muslims and Islam in Africa. http://www.sharia-in-africa.net. Accessed 28 May 2012. Waghid, Y. (1998). A review of Muslim schools in the Western Cape: A philosophical interlude. http://web.uct.ac.za/depts/religion/documents/ARISA/1998_10.pdf. Accessed 28 May 2012.